A few days ago I got a request for magical help, in an email that said: “My laptop was stolen from [a building with a lot of occupants]. Can you help me find the culprit and somehow locate my laptop?” The words in square brackets are not exactly what the email said, but describe the location without revealing too much about the person with the problem. I have a great deal of sympathy for anyone whose laptop is stolen. Quite apart from having lost a valuable piece of equipment, laptops usually have lots of important stuff on them – work, photos, emails and all manner of information you wouldn't want to lose. Before trying magic to recover any lost or stolen item, obviously you should try to get it back by normal means. Search the building thoroughly to make sure your stuff really has gone missing. Talking to anyone who might have seen what happened and anyone in charge of lost property. If you’ve been a victim of theft you must contact the police and report the crime. Then check if the item is insured or whether the building’s contents insurance covers laptops. I would add that people normally only turn to witches for advice after they have exhausted every other avenue to get what they want, which is perfectly understandable. Nevertheless, I do believe that spells and magic can help nudge things in the right direction. Some time ago I blogged about Spells and Divining to Find Lost Things. In that post I mainly talk about using dowsing and scrying to help locate items that have gone missing. But here is a spell specifically designed for helping in recovering a stolen laptop – and maybe also find out who took it. The spell calls on the help of Mercury, who is the Roman god of communication but is also considered the god of computers and even the god of slightly dodgy deals. Just the deity you need on your side right now. In magic, the Moon is said to have the power to help people find things that have been lost, so this spell calls on the help of the Lady of the Moon too. What you are going to do is create a talisman specifically to help get your computer back, and possible find out who took it in the first place. What you need is a small piece of plain paper or card, a silver marker pen and either a photograph of your computer (if you have one) or a picture of the same model of computer (which you could probably download from the internet or cut from a catalogue), a pair of scissors and some glue. Personally, I would prefer to do this spell by candlelight, but that’s optional. On a Wednesday night, when the moon is at least partially visible in the sky, dim the room lights and light your candle, if you have one. Sit down at a table with your paper or card and marker pen. Take three deep breaths, in and out, and clear your mind of everything except your desire to get your computer back. In your own words, ask the God Mercury and the Lady of the Moon to help you. Explain the whole situation to them and what it is that you truly want. 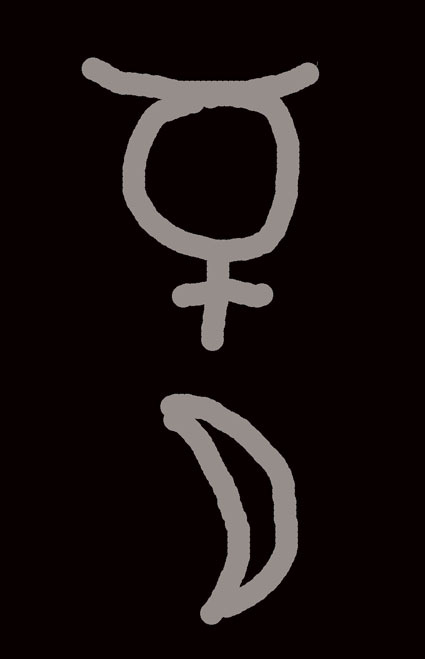 Then draw the symbol for Mercury and the symbol for the Moon on your piece of paper in the silver pen. (You can see my attempt in the picture above, and I think that demonstrates that you don't need to be any good at art to do this.) After you have drawn your symbols, carefully glue the picture of the computer to the back of the paper. You can use the scissors to trim it if necessary. Finally, thank the God Mercury and the Lady of the Moon for their help in making your talisman, blow out the candle, and keep your talisman with you at all times until you feel it has done its work. Personally, what I would do in your situation, after creating the talisman, is to make several posters asking for information leading to the recovery of the computer and then stick them around the building. Offering a small reward if the computer is recovered might increase your chances of getting results, but that is really up to you. I would add that the planet Mercury is retrograde at the moment, which can mean plans go awry. If you believe in astrology, then you might want to delay any spell that involves Mercury for a couple of weeks, or you might think that the influence of Mercury being retrograde will work in your favour and only mess up the dealings of the thieves. The best way to prevent theft of the laptop is to have Rewardid label on it. RewardID labels include a unique ID number which connects to the owner's online profile.When someone finds a lost item, they can plug the ID number into our database to access the owner's contact information. Hi, I had my backpack stolen recently in an airport, I confronted the person I thought had stolen it but couldn't get them to give the bag backand I don't know their name or where they live. Various things were inside including my netbook. I reported it to the police and have messaged the airport lost and found. I don't want revenge on the person, I just want my things back. Would this spell work for my situation or should I try something else? Any advice you have is appreciated. Also, contact your holiday insurance company as your laptop and luggage should be covered under the insurance. Thanks!!! Do you have any thing to stop an cheater /theif and lying boyfriend ? Personally I would just dump a cheater /thief and lying boyfriend and find a nicer one. Please can you help? I helped my friend out and stored her things in my loft whilst she was in-between houses. I have helped her out with any issues. When she came to take her things from my loft I inadvertently gave her a bag containing my heavy tapestry curtains. The fabric costs £100 per metre now and the curtains are worth £3000. I know I gave her the curtains 100%. She reckons she has never had them and can't find them .I can even see myself giving her them in my head. Please what can I do to get the back? I have a good friend also my husband boss that his truck was stolen from his home last night. He has called police and even spent hours driving and looking. We live in a small community and he is a very good person who does not deserve this. I am searching for a spell or incantation of sorts that'll not only help his truck be recovered. But will also ensure the thief never steals again. Can you help please. I am not looking to curse the thief so to say but maybe just his guilt alone will bother him enough to never do this again. I like the computer spell but not sure what to do about this. Thank you any helps appreciated greatly. Just need some guidance on this to ensure I pursue correctly. Blessed be! Could this by chance work with something else? Say... An expensive watch that I believe was stolen from my home by a family member? It could work for other things. I have stolen my neighbours gold chain. Will I be traced or can you help me to escape from them. Someone has stolen my clothes from balcony. I live in the hostel. You should give it back to avoid negative events happening to you. If you don't have the confidence to explain your actions to them, wait until they are inside and either say you found it or just leave it somewhere safe that they will find. Stealing anything is never worth the repurcussions--especially not an item that is not a necessity.